When you drink wine socially you have one glass in your hand and you either like the wine or you don’t but you drink it anyway just because it is there. When you are a wine taster there’s often more than one bottle open and it’s all about swirling, sniffing and sipping one wine after the other while making evaluations, making comparisons, asking yourself which one you like best and ranking wines in order of preference. But for me it is often not as simple as saying A is better than B. I like to also try wines with food and that can change the comparison rankings on their head. For this wine tasting exercise I opened Te Mania Nelson Pinot Noir 2015 ($24.99) and Richmond Plains Nelson Pinot Noir 2015 ($28.99) to taste on their own then to accompany with lamb shanks to see how they would fare. Both wines are brands of Organic Wines NZ where Steve Gill is winemaker, both are suitable for vegans (ironic when I am matching to meat), both are certified organic and Richmond Plains is also certified biodynamic. Tasting the wines alone Richmond Plains was an easy favourite but when it came to accompanying the food, Te Mania that was the wine I thought was best. Te Mania Nelson Pinot Noir 2015 (13% alc) is clear bright ruby in the class. Luscious bright fruit such as cherry and cranberry jelly wafts out of the glass. Savoury, a little herbal and momentarily steely in the medium-bodied palate with velvety tannins, cranberry and red plum fruit and a touch of vanilla on the finish but the fruit just lacking in sweetness compared to the Richmond Plains. Richmond Plains Nelson Pinot Noir 2015 (13.5% alc) is also clear bright ruby in the glass. It’s quite concentrated on the nose and richer and more complex in the palate where I find bright fruit reminiscent of juicy red berries with just a touch of tamarillo, a suggestion of rosehip, hints of anise, creamy oak and a well-balanced savoury finish. There is an intriguing sappy/slightly gamey undertone to the wine which puts the thinking cap on. This is the wine I want to drink on its own. One of my standard winter dishes is lamb shanks. I brown them off in a pan and put them in a casserole dish. I deglaze the pan with water, add a lavish dollop of pinot noir, a splash or two of Kalamata orange balsamic glaze, orange juice and zest (although tonight it was two unsqueezed mandarin halves) and this all goes into the casserole with herbs such as rosemary, thyme and mint plus a handful of kalamata olives and a generous amount of fennel seeds. More water is added so the shanks don’t dry out while cooking – and they cook in a slow oven ’til the tender meat falls off the bones. Te Mania was excellent with the lamb and while not so good with the olives perhaps because of the more herbal notes in the wine, with the olives out of the equation it showed how food can elevate an awkward wine into a seamless match. Richmond Plains, while not such a satisfying food match was good nevertheless and better with the olives which revealed previously hidden citrus notes in the wine. An interesting exercise. Try it some time. And if you only have one of the wines rather than pitting one off against the other, I am sure you’ll be satisfied. 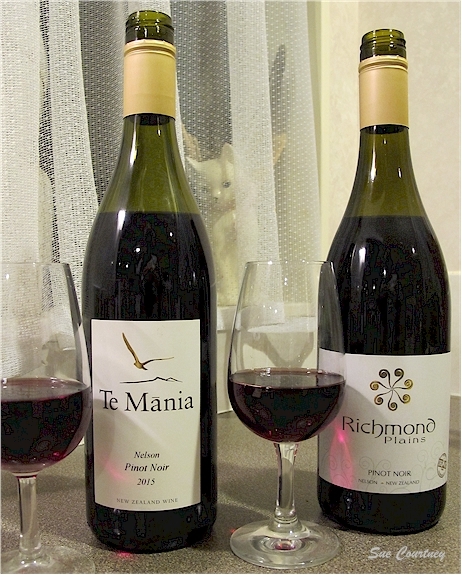 This entry was posted in #nzwine, nelson, pinot noir and tagged 2015, Richmond Plains, Te Mania by Sue Courtney. Bookmark the permalink.